Salome Thomas-EL on Dr. Oz! You can tell that Salome Thomas-El understands the life of hard knocks. 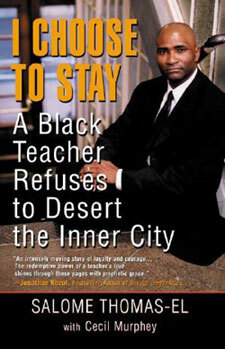 Having grown up in the Philadelphia housing projects to a single parent, he had to deal with adversity. Now as an adult, he is teaching others to deal with adversity. Walking with a professional swagger, he asserts, “I’ve never met a child I cannot turn around.” Rest assured, Thomas-EL has the record to prove it. Thomas-El has become known in previous years as a hardnose educator known to mete out “tough love”. He wrote a popular book, “I Choose to Stay” about his evolution into a Principal and an inspired coach of a chess team of overachievers. He later wrote another book, “The Immortality of Influence” dealing with issue of role modeling. Thomas-EL is still on the beaten path and recently appeared on “Dr. Oz” discussing the importance of good health and diet and the idea that parents have to be good role models in terms of lifestyle. Dr. Oz is a popular talk show host who focuses on lifestyle management, health and nutrition. The segment he invited Thomas-EL on highlighted a major issue in the Black community, poor diet and nutrition. As part of “Team Oz”, his pledge was to help the guests (mother and daughter) get into acceptable shape and encourage good health and nutrition.